Click the (Table Tools) Design tab. 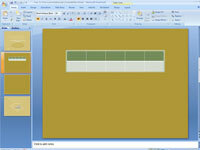 Options for your table are displayed. 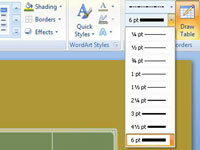 Select the part of the table to which to add a border. 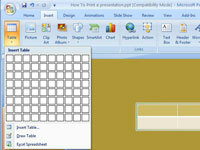 To select the entire table, right-click it and choose Select Table. 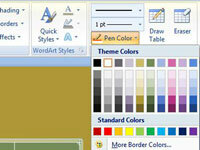 Open the Pen Color drop-down list and choose the color for your borders. You may have to click the Draw Borders button first, depending on the size of your screen. Open the Pen Style drop-down list and choose a line style. Stay away from the dotted and dashed lines unless you have a good reason for choosing them. These lines can be distracting and keep the audience from focusing on the data being presented in the table. 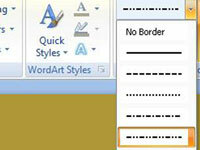 Open the Pen Weight drop-down list and choose how the border’s thickness. Make you border thick or thin or something in between. 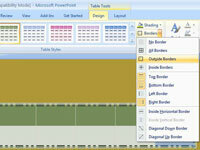 Open the Borders drop-down list and choose where to place borders on the table. The Borders commands have different effects, depending on which part of the table you selected. For example, if you selected two rows and you choose the Top Border command, the command applies only to the top of the uppermost row. Repeat Steps 5 and 6 until you get it just right.